My Complements; the color wheel is finished! This is the block Norma made that I got to work on. She pieced it and embellished about half, then it was sent to me to finish. I think it is finished, but I won't mail it out till later this month, so I can still do more if the inspiration strikes. Norma has my block and is finishing it for me. I've seen a pic of it finished, but I can't wait to see it in the flesh, or in the fibers, I guess that should be. Very nice, Janet. Did you do the pretty cross stitched braid? Are those pink flowers beads? It's hard to tell in the photo. I agree, it looks done to me, although my fingers were itching to add beads to the mesh of the heart that has the green beads in the border. LOL. Now, why don't I get busy on my own stuff? Hi Janet, Norma should be thrilled with what you've done to her block. 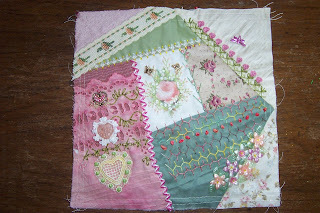 Very pretty stitching! I also wanted to let you know that I nominated you for a Premio Award on my blog... just the award part, you don't have to do the meme part, Paula Hewitt really got me good when she sent me both at once LOL... Hope your summer is going good!